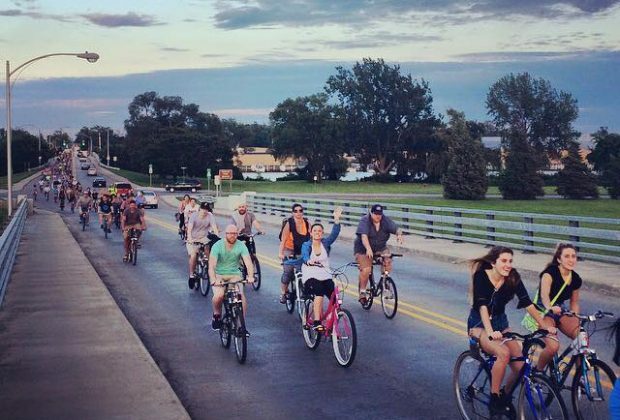 So you want to start a community bike ride in your city. You have some ideas, but also have some questions about how to create a successful ride and how to handle logistics. Here are five tips to keep in mind as you move ahead with planning. Scenic, safe and fun routes tend to draw interest. “Not too long. Not too short,” says Ty Schmidt, executive director of Norte!, the nonprofit that organizes TC Rides, a weekly community bike ride in Traverse City. 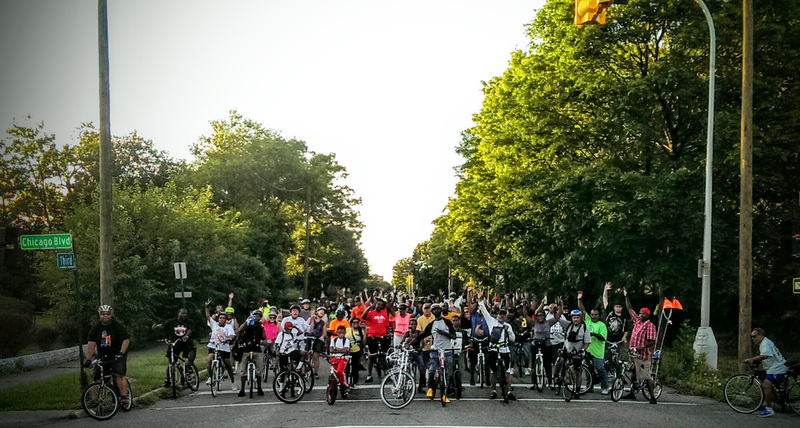 Sarah James, who started the Palmer Park weekly ride in Detroit six years ago with fellow cyclist Henry Ford II, wanted to re-introduce people to a cleaned up park. “It was our childhood park,” says James. 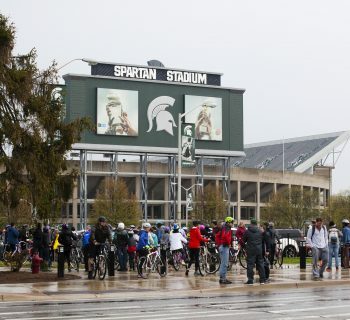 “We wanted to start getting people in the park and feel safe using it.” The group initially rode through newly cleared park trails, but as the ride has grown in size, they now cruise on paved streets, weaving around surrounding neighborhoods. It still starts and ends in the park. Tanner makes sure to avoid streets with potholes or debris. He says that he’s ridden down every street in Bay City and continues to do so, since the B.A.R.S. route changes weekly. Tanner likes to take cyclists over an occassional bridge, of which Bay City has plenty, and skirt the Saginaw River as much as possible, especially on the return trip when riders can take in a sunset. One key to success is to associate yourself with avid cyclists who will help promote your ride. Bike shops will usually be happy to help you promote your ride too, and Facebook is also a popular way to share information among community cyclists and ride participants. Schmidt has gone a step further and invited local celebrities to join TC Rides. He has City Commissioners ride on one of the weekly rides every year, using their presence to both promote the ride and remind commissioners to keep bicyclists top of mind. Aside from government officials, there’s the real celebrity sect. “We've had our fave local band, The Accidentals, attend who brought out a record crowd for TC. 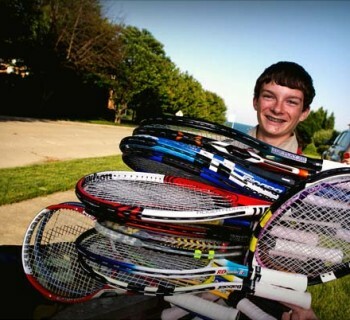 Nearly 200 people,” says Schmidt. Meet: 7:15 p.m. Depart: 7:30 p.m.
Is everyone welcome on your ride, including really slow riders and children? Is there a required level of rider? “Be communicative about what kind of a ride it is,” says James. The Palmer Park ride has turned into a slightly faster ride as it’s evolved. Communicating the expected pace and ride requirements is important so people can appropriately join or not. For example, in Bay City, the B.A.R.S. ride is for those 18 years old and up with no pets allowed. 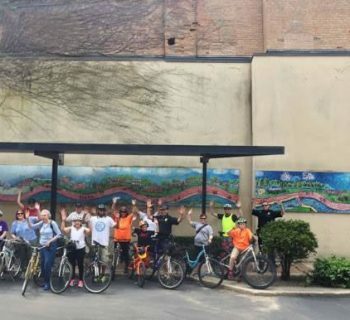 But in Albion, creating an bi-weekly Saturday ride that encourages all people to join was a priority for Larry Williams, program coordinator for the City of Albion Recreation Department. He was originally tasked with creating bike programming just for older citizens. 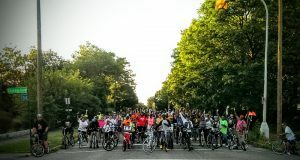 After giving it some thought, Williams proposed to the city manager to instead implement a bike-riding program that would be inclusive of all residents. TC Rides, while its focus is on families and kids, also welcomes everyone. This makes sense since Norte! has a mission to build community with bikes, promote an active lifestyle, and provide a forum to meet new neighbors. “People on bikes creates more people on bikes. It’s infectious,” says Schmidt. Commit to a schedule and have a core group of people who will be there regularly to help with the ride or assist as corkers and sweepers (the rider last in the line whose job it is to make sure every rider arrives safely to the end destination) as your ride grows. Set expectations for yourself and your volunteers so the ride always happens at a consistent time and on a consistent day. This will attract both new and returning riders. Meet: 5:45 p.m. 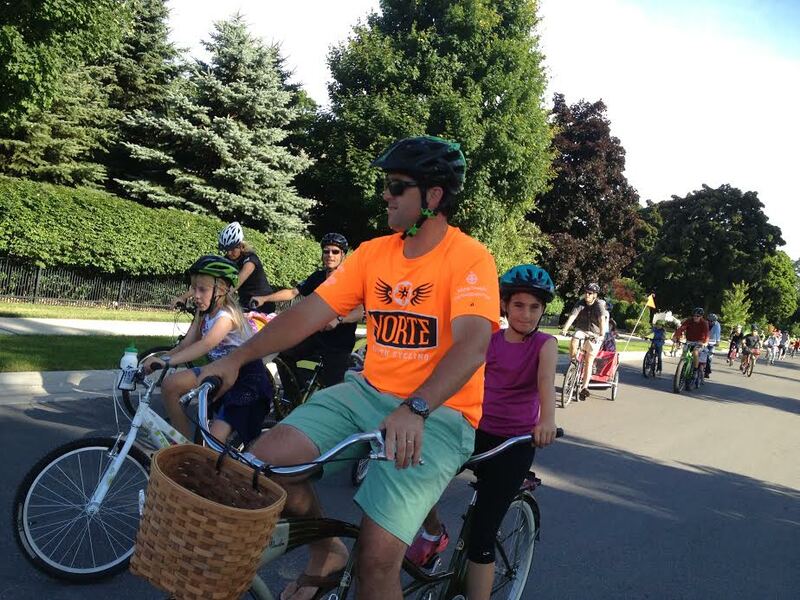 Depart: 6:00 p.m.
Community rides are a fun, fumes-free, exploratory way to see your community and meet new people. “People who start group rides are not the spandex people who want to race and be by themselves,” says James. The fun factor was definitely at play when Tanner first organized B.A.R.S. “I’d been on group rides in the area before, and they were either boring or too competitive,” says Tanner. “B.A.R.S. 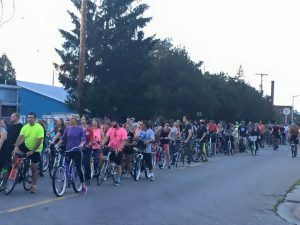 of Bay City was the compromise, where any level of rider can come out and hop on a bike.” He started the ride last year with a group of 15 to 20 friends. It took off, caught fire, and now attracts hundreds. “Make sure the fun dial is turned up high,” says Schmidt of TC Rides. “Ending somewhere cool like at your hip neighborhood food truck hangout is always good too.” Rides that encourage family participation often end at kid friendly locales, like a park or ice cream shop – or food truck corral. Does your community need an organized bike ride? Find a route, pick a day, time and meeting point, and spread the word. You could be your town’s next ride leader. Saddle up! Note: more resources for family-orientated rides can be found at Kidical Mass.